Salmon: Cut EIGHT (8) 3 3/4″ squares. On the back side of the square, draw a diagonal line, corner-to-corner, ONE (1) time. White: Cut EIGHT (8) 3 3/4″ squares. I went to quilttherapy.com to get the free pattern, did a search for pigs in a blanket pattern, and got the message that nothing was found. What now? Deborah: The free pattern is written on this very page you left your comment on. The image of the quilt block is the first thing in the blog post, this is what your quilt block should look like once you finish it. The cutting instructions are next and are listed in bullet format. 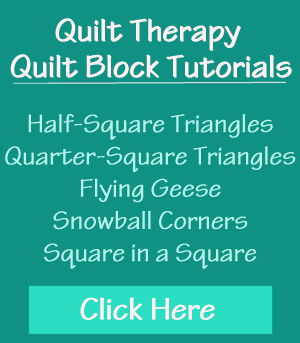 Finally, you’ll find the diagram for putting your quilt block together. 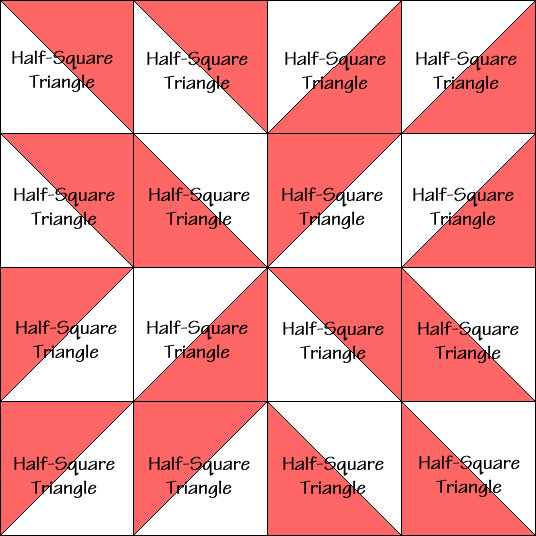 The entire quilt block is made up of half-square triangles. When you cut out your Salmon blocks, you are instructed to draw the diagonal line on the back side of each of them. Then you put a Salmon square together with a White square, right sides together, and sew 1/4 on EACH side of the line you drew. Finally, you cut the squares apart ON the line you drew. Once pressed toward the Salmon (always press toward the darker fabric, if possible) fabrics, you will have two half-square triangles. Repeat this same process for all of the squares you cut out for the quilt block. 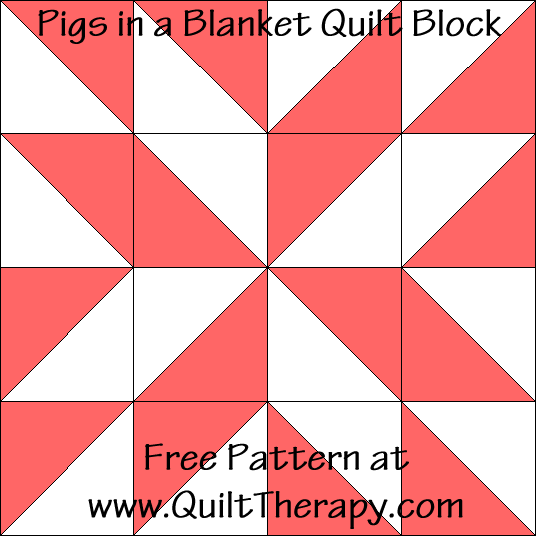 Then sew your half-square triangles together so you end up with the Pigs in a Blanket Quilt Block! Easy please!!! Love, love, love this simple quilt block. My 8 year old niece is making on as her 4-H project this year. Thank you so much for the simple instructions that she can follow with minimal help from me. I just have to supervise…lol.